Take Interstate 55 to exit 96, and go east on William St.
Take Highway 146 to Highway 74. Continue west on Highway 74 to S. Sprigg St. 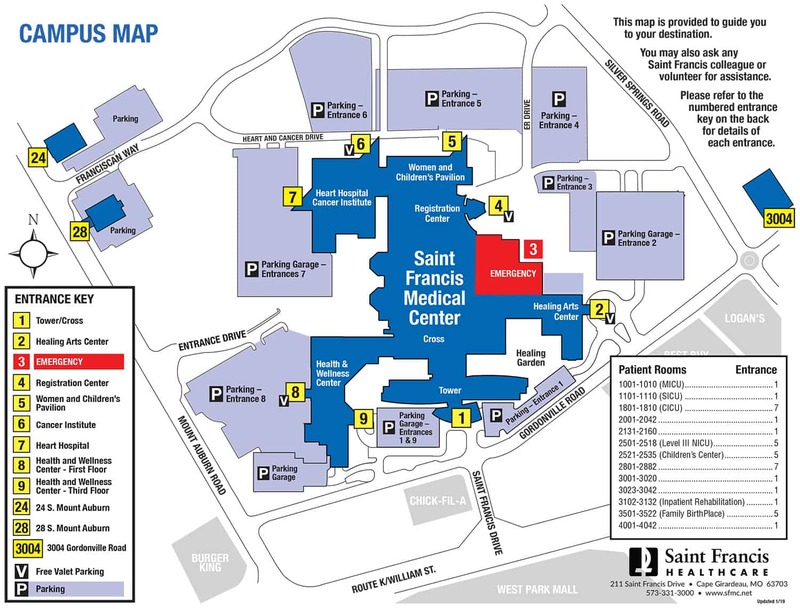 Turn right on S. Sprigg St. and left on William St.
Click on each entrance number below for information on which physicians, practices or departments can be accessed through each entrance to Saint Francis Medical Center, as well as parking and driving directions for each entrance. Based on your destination, please plan to use the correct entrance when you visit the Medical Center and park in the correspondingly numbered lot or structure. All entrances and parking areas are clearly numbered to assist you in finding your way to your destination. Go east on William Street. Turn left at Saint Francis Drive. Turn right at Gordonville Road. Entrance is on the left. Park in Lot 2 garage (to the right) or continue to the Healing Arts Center for valet assistance. Continue west on Highway 74. Turn right on Silver Springs Road. Go left at the roundabout on Gordonville Road. Entrance is on the right. Turn left at Silver Springs Road. Turn left at Franciscan Way. Park in Lot 3 (on the left) or continue to the drop off area for Emergency Services. Turn right at Silver Springs Road. Park in Lot 4 (on the right) or continue to the Registration Center for valet assistance. Turn left at Mount Auburn Road. Turn right at Franciscan Way. Park in Lot 5 (on the right). Park in Lot 5 (on the left). Park in Lot 6 (on the left) or continue to the Cancer Institute for valet assistance. Turn right at Mount Auburn Road. Park in Lot 7 garage (on the right). Park in Lot 8 (on the right) or continue to the Health and Wellness Center/Fitness Plus for valet assistance.